I sleep in! Oh the luxury! I'm not sure what time I got up, but it was much later than normal. The wind completely died out over night. Still and calm and not as cold as it has been. I get up and see the sun’s rays on the other side of the canyon, soon they will reach me. I have breakfast and sort my lunch snacks. As I am cleaning up, the sun's light reaches me, a warming sensation on my back. The chill removed from the air. Now this is something I could get used to. To top it off, I believe I might be able to go the whole day without getting my feet wet. Muir Pass is the foot soakingest pass. Nine miles of snow and potential postholing. I want to minimize the postholing so I need to start it as early in the day as I can. In order to do that I want to camp as close to the snow as convenient. Tomorrow I'll get up early and try to cross the snow before noon. That means that I am only hiking about fourteen miles today. I start late. But what is late, really? I start when I start. Downhill, down off the granite shelf that holds the Palisade Lakes. Down a section of trail dubbed ‘the golden staircase.’ I'm not sure why it's called that. It has about a million switchbacks, the switchbacks have stairs in them. I didn't see any gold though. Down the switchbacks, some of them turned into streams by all the snow melt. I am jumping and skipping from rock to rock, trying to keep my promise to myself that my feet will stay dry all day. The air is warm, what a treat! The lower I go the warmer it gets. I camped at around eleven thousand feet. This trail is descending to eight thousand feet before it turns about and heads back up and over Muir Pass. At the bottom of the switchbacks the trail turns and heads into the forest at a gradual downhill. Perfect trail, at least my favorite. I move fairly quickly but stop often to take pictures, replace snacks, or simply enjoy what I am doing. This is truly to most beautiful trail I have ever been on. The water rushes and roars, Palisade Creek, from the outlet of the lake, fills this canyon with sound and life. The trees and plants have decided it's spring and blooms and blooms are everywhere. The smells of flowers fill the air. The sky is blue, not a stitch of a cloud. I am moving through all of this at my own pace. Come to think of it my right knee hasn't bothered me for days. 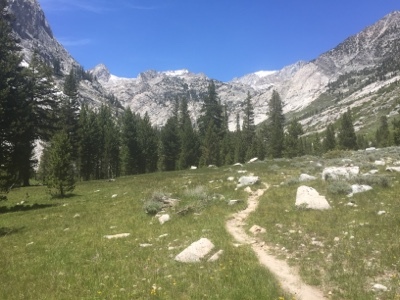 That last day was the day I hiked down Kearsarge Pass into Onion Valley trailhead. Ever since then I haven't even had a twinge of pain. I walk down the trail at my cruising pace, both legs doing their thing without me having any thought of having to compensate for my right knee. I reach the bottom, I stop for lunch. Peanut butter and honey on a flour tortilla. Wow, it's so amazing. I snagged the honey packets from the condiment bar at the coffee shop in Lone Pine. They really add that extra zing to an already great snack, the tortilla with peanut butter. I sit with Osprey and Buff, all three of us doing our lunch thing. Then we sort of nap and dilly-dally. I know that I have plenty of time to do so. I've been doing twenty plus mile days for so long that fourteen seems short. I finally get up and put on my pack. The climb towards Muir Pass is consistently up. A long slow up. Steeper than Forester or Mather, you know you are climbing. I am glad I am not climbing the whole thing today. It gives me another day to eat more food out of my pack. Making it lighter. The canyon is filled with the sound of rushing water. A solid white-noise background that masks all but the loudest forest sounds. I climb and I eat. I have found that eating is as important as the actual walking. My energy level drops pretty fast if I stop eating and just hike. I am not sure how much weight I've lost but my belt seems to be about two or three inches longer. As long as I'm eating I feel strong enough to keep climbing. Around fourish I find a campsite that has afternoon shade. Perfect! I take a nap until I wake up hungry. Then I get up have dinner and cleanup. Then it's back to my tent to rest for my big day tomorrow.